will be undamaged, and if there is an earthquake, a great deal of the items will stay in tact and unbroken. I make sure that I use food-grade buckets only. When it comes to the lids, I use regular 5 gallon lids, but I have several gamma lids also. I replace the old lid with a gamma lid once I’m getting into the bucket regularly for items such as wheat, beans, and rice. The gamma lids have a great seal on the bucket, but can be easily unscrewed in the inner circle of the lid for my use. The gamma lids cost about $5 to $7, so that’s why I don’t just use them on all of my buckets. 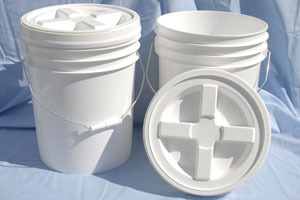 The 5-gallon buckets also have “toilet seats” for emergency sanitation. (I’d like to pat the guy on the back who came up with that idea.) I’ve been using 5 gallon buckets to store a great deal of my items almost exclusively until about 2 years ago. That’s when I discovered the 4 gallon square bucket. Buckets are also great to keep other types of contents in them. For example, I’m frequently getting good deals on small bottles of olive oil. (Thank you, coupons!) Instead of stacking them on a shelf and leaving them to the wiles of an earthquake, I wrap them up with newspaper (again--thanks to coupons) and place them in a bucket marked “olive oil.” (Yes, I came up with that brilliant label all by myself. Hee hee.) Now, with these square buckets full of olive oil, I can easily and securely stack them on top of each other. Whereas with my large containers of olive oil that I got from a warehouse, all I can do is have their big selves take up space on the shelf or floor in a single layer. That sure is a waste of height, don’t you think? This way I’m not forced to shell out for expensive shelving for everything. The same goes with BBQ sauce, spices, salad dressings, etc. Some items simply come in awkward sizes and shapes, but the buckets sure make things nice and organized for me. Since I don’t buy my items “by the case” usually, I can’t store them that way. Where do you find these buckets? There’s several options. “Wally World” sells them, but I hate their prices. You can easily get used buckets that were used for food grade purposes in a myriad of locations--though you'll have to work at it. During the harvest season you can get them directly from fruit growers for $1.50 or so. You can also obtain them from bakeries in your local grocery stores for FREE. So try making a few calls and make the most of those options first. However, in many areas I’ve lived, getting them year round has been a challenge. Thus I’m in love with Five Star Preparedness as my bucket source for this reason. They have used, 4-gallon, food grade buckets all the time, and tons of them too. (You can get about 25-28 pounds of grain and such in each bucket.) Each used bucket and lid are $2 each. They guarantee that each bucket and lid will be in sound condition or they will replace it cheerfully. Even better, for those of you who are in Utah or who come through the area, if you pick up the buckets yourself they are only $1.50. They will ship them in increments of 20 all over the continental U.S. with no additional handling charge. Another option is that you can have them make a massive delivery to your area based on a minimum bucket order--that will dramatically cut down on the price and the shipping. Apparently there are requests frequently from church and community groups that request these by the hundreds. The minimum bucket count for the order depends on where they are being delivered. You can also get the new lids that I mentioned as well for only $2.50 I found these same lids at “Wally world” for more than 3 times their price! You can visit them online at www.fivestarpreparedness.com or you can e-mail them at fulfillment [at] fivestarpreparedness [dot] com and their direct contact info is there too. Copyright Protected 2013, Preparedness Pro and Kellene. All Rights Reserved. No portion of any content on this site may be duplicated, transferred, copied, or published without written permission from the author. However, you are welcome to provide a link to the content on your site or in your written works. I really love the square bucket recommendation. As for the round buckets, Donna Miller at Miller's Grain House carries buckets with a lid that's easy to open. I put up a blog post on this some time back, which features a video of Donna demonstrating the buckets and lids. You can check it out at http://www.destinysurvival.com/2008/10/20/survival-kitchen-an-excellent-... .
You knew I needed this, didn't you? :) Space conservation is key around our place. I'll have to get an order in for some of those square buckets . . . I resolved any doubts by calling the company that manufactures the orange 5-gallon buckets for Home Depot. They are indeed NOT food grade. That cuts it, I'm going to get the 4-gallon square ones. I had hoped to use the orange ones, them being only a bit over $2 plus another $1 for the lid, but the 4-gallon ones have several advantages (price, food-grade, storage efficiency and stackability). No doubts now. Thanks for the article. Folks, don't forget the mylar bags for foodstuffs that you're not putting in Foodsaver bags. I plan on dehydrating a lot of food, then vacuum-sealing them in mylar and sealing them up in buckets. Those ought to last for a while - little moisture or oxygen, no light...little decay over long periods. Still haven't found those square buckets on the island but won't give up. I do not like the buckets from Emergency Essentials cause they have their name on them...I do not want to advertise to everyone that it may be preparedness things. Why do you put the box of rice a roni in a vacum seal bag.... in case of bugs? Razr, I'm confused. What can I help you with? Being low on funds, I only use free buckets - and here that means round ones for food. I get them from the bakery dept of one of my local grocery stores, in 2, 3.5, and 5 gallon sizes (with gaskets) and 4 gallon ones without gaskets. Food goes into the ones with gaskets. I store non-food items in the 4 gallon round ones, as well as any 4 gallon square ones I can get through Freecycle. Those square one aren't food grade, and used to hold cat litter. I suppose I could wrap and store cans and bottles of food items in them, as you point out! I seal them due to the hydrogenated oils to keep them from going rancid sooner rather than later...also to keep out bugs. The recipe is on this site. Do a search on "poppyseeds" It's my hubby's favorite casserole. Their site isn't up yet. You can only snag them via telephone. Taking back to us? That must having something to do with the executive office set up that we share. Sorry. Direct calling is all that I have to recommend right now. Did they take good care of you, Charlene? It's important you guys give me feedback on the businesses that I point you to. Thanks! I definately would not use kitty litter buckets for ANYTHING. The ones I've recommended are definately food grade. And you know me, I'm always a sucker for something FREE that's useful as well. I have several bakeries locally that have started using the square buckets for the same reason that I have. So keep checking with them. I've even found them in 2 gallon square sizes as well. I wrote an email to them and asked several questions. They were prompt in their replies, and seemed willing to help. I inquired about what the minimum might be on a bulk order - 600 buckets! I live in KS and she indicated that if we purchased 600, there wouldn't be any shipping charges. At first I thought this a daunting endeavor, but as I sat and started making my bucket "wish" list, I had need for over 50 myself. I'm going to attempt to put together an order if there is any interest. However, without folks first seeing one, this makes it difficult. I indicated to the company that perhaps I should just order myself so I would have a sample bucket to show folks. Would have been nice for the company to offer to send me one for that purpose when we are considering so many. Ahhh... I guess the old days of that kind of customer service are gone. I'll keep you posted moving forward. I have not yet ordered anything from them. I also asked them about shipping a bucket to you. They had sent pictures. Apparently it costs them almost the same amount of shipping to send one as it does to send 5. They have had "requests" for over 30 "free" buckets just in the last week. And their margins are too small to handle that. That sounds very reasonable to me. I use the buckets for different things. I never use both a bucket and a mylar bag though, if that answers your question. Although there's a certain "overkill" kind of company out there that markets their wheat that way and charges more for it. But that's a bit goofy because the weevils are already inside. In my opinion anything you use to store vital supplies should be safe and protective appropriately for those supplies. I rarely find "cheap" things that I would trust to protect my food. Just to clarify what you wrote above, if I am storing pasta or flour in a food-grade bucket, you would not recommend putting the pasta (or flour) into a mylar bag first? Would you store the pasta in its own box or just dump a bunch of boxes of pasta together in the bucket? Thanks. Flour, I would likely put in a mylar bag first, because I don't need an oxygen exchange for that and flour is so volatile anyway, you need all the help you can get. The same can be said for anything that's already prepared from flour. It's whole grains that I don't see any sense double packaging when Diatomaceous earth is available and you actually WANT the grains to breathe for future sprouting and optimal nutrient content. I know we discussed The Bucket Guy on a different post (I cant rememember which one) but he did call me this week and delivered to Reno, 150 4 gallon buckets at $4 each. I swear the lids look new. Very satisfied and worth the wait. I was VERY surprised to even hear from him! Since I believe it was June when I placed my order and had the kafaffle. I had a doctors appoitment in Reno that day and he met me there and loaded the truck with my Dad while I was in my appointment. Very nice young man. After a rough start I am glad I waited. I wanted you to know because I know you rely on him as well. I know I have been MIA awhile due to a nasty MS attack and not doing well but I am ready to dig back in as there is still a lot of work for me to do! :) I have missed reading every day as it is part of my daily ritual! Hope all is well with you. Ready to try your breads next! I hope your health improves and that you have a Merry Christmas! Lowe's buckets and lids are 3.50 and walmarts are $7.00---I learned the hard way...now I get all at Lowe's. says: "New 4gal Plastic FoodGrade Storage Container with Gasketed Snap-On Lid for only $7.75 each" plus "Our shipping for buckets starts at just $1.25 per bucket"
That equals $9 a bucket... a far cry from $2 as hinted in previous posts. @Johnathan You're right, Johnathan. I believe the previous posts were referring to used buckets. But I don't think Five Star has those anymore unfortunately. The price of resin has risen so much in the past 2 years that the folks who were selling their old buckets for a song now make more money recycling them. Also note, the article you've commented on was posted in Oct. of 2009. Some of the articles are time sensitive. Sorry for the misinformation. I followed your links to the five star preparedness website but there were no buckets, only food for sale. What happened to the buckets? I have no idea. You'll need to ask Five Star Preparedness as it's not my business. Sorry.